Speaking of minerals, AVON just steered into the mineral makeup lane and put out a line of powder foundations, blushes and eye shadows. 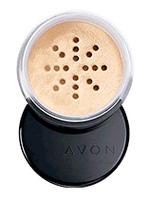 I, of course, gravitated to the powder foundation with Smooth Mineral Makeup ($10/.21oz). I couldn’t find any ingredients to the powder so I’m not sure if it is made with from pure minerals and if it has filler ingredients in it. Anyway, out of 137 reviews on their website, 82% of them would recommend it, and so do I. And the price is so right. $10? Nice. The Smooth Mineral Eye Shadows ($8/.05oz) rated a little higher than the foundation and the packaging is the best I’ve seen for mineral shadows. There is a hole in the middle of the pan where you can stick the brush in to grab some color or dip your brush in the hole in the cap. Both @ avon.com.